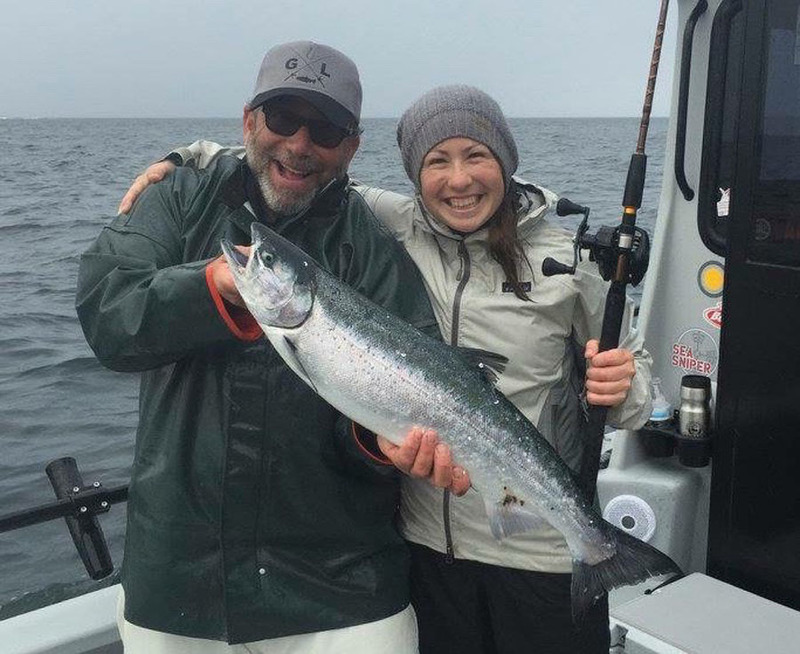 Over the years, our guests have had the most enjoyment fishing light tackle, it gives the fish a fair chance to escape and the angler a chance to see the true power and tenacious nature of a salmon and other fish. While the techniques vary widely for catching salmon, the two techniques we most commonly employ are trolling with Cannon electric downriggers or Mooching (drifting with bait). Each style has its place and we will explain how and why we are using one technique or the other. By the end of the day of fishing, you will likely be well versed in both. On the Gray Light, you will only use the best tackle. We selected Abu Garcia Revo “Beast” bait casting reels spooled with 16 pound Berkley pro spec line and Berkley IM6 graphite mooching rods. Our trolling gear consists of custom Penn Torque 12 reels, which have been specially modified to have a very smooth drag in exactly the range needed for this kind of fishing and they are paired with custom Penn downrigger rods. The downrigger system works best when the tackle is matched to this style of fishing. We also have lighter (4 kg) tackle, available for those wishing to use that for Silver Salmon fishing. The bottom line is Salmon often hold at a specific depth and getting bait or lures to that feeding zone is critical to catching fish. Each technique achieves this objective differently and depending the conditions, one way is often superior to the other. Having right gear to do both is important to insure your best shot at a great day of fishing. We keep all our tackle very light, so you can enjoy the battle with each and every salmon you hook. With that said, if your group prefers fishing with slow pitch jigs, swim baits or even fly fishing, We are happy to allow you to bring your own personal gear and can accommodate any style of fishing you prefer. 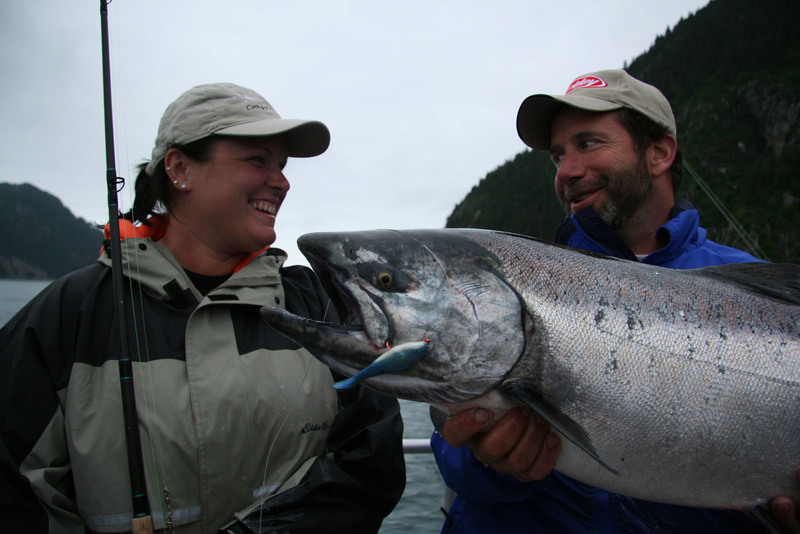 The Chinook or King salmon, is the most coveted, wiley and toughest game fish we catch in Alaska! 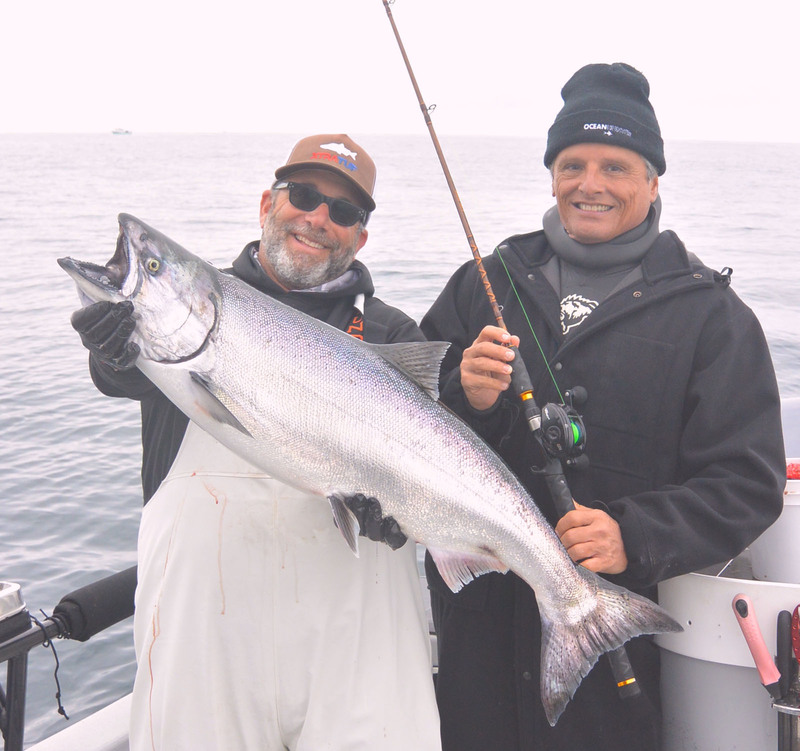 The king salmon is also one of the most important sport fish on the Pacific coast. It is the largest of the Pacific salmon, commonly exceeding 30 pounds. The 126-pound King salmon taken commercially in 1949 is the largest on record. 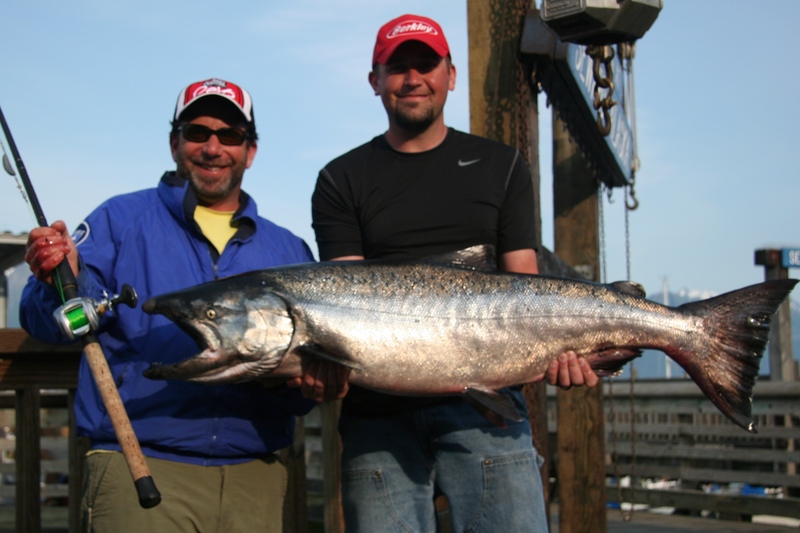 The largest sport caught King salmon was a 97-pound fish taken in the Kenai River in 1986. The Chinook is an important keystone species to the Pacific Northwest and Arctic ecosystems. Healthy runs feed not only Orca or Killer Whales, Bears of all kinds, and other meat eating mammals but also are critically important to the Native Alaskan subsistence life style and sustain many communities through out Alaska and the Northwest. In short, King Salmon are Alaska! 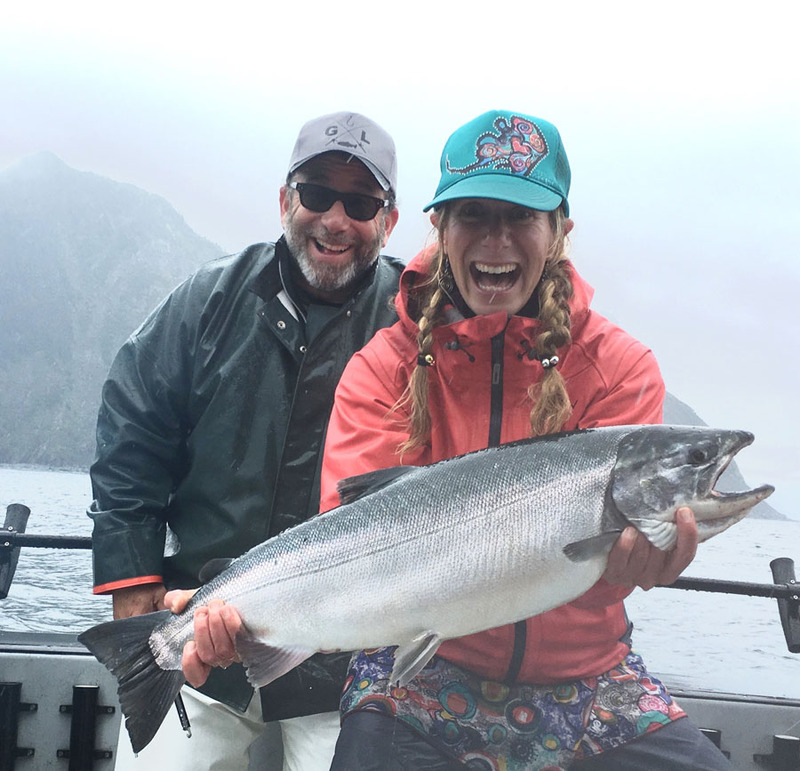 In Seward, Alaska there are a few charter boats target local feeder king salmon. These fish can prove elusive and catching one will provide a battle you won’t soon forget especially on our custom made light tackle. 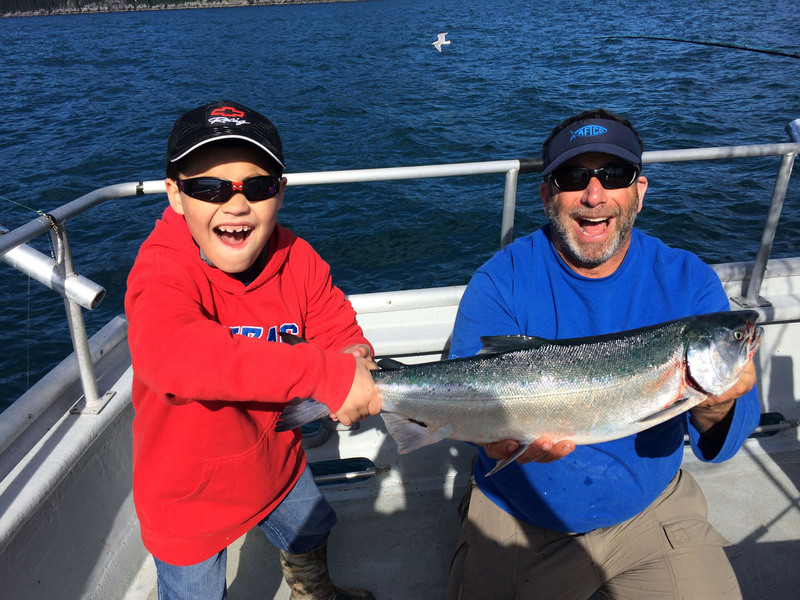 Although they can be caught year round, we have found from early spring through the fall are the best (most comfortable) times to fish for resident feeder king salmon in Seward. Although good catches are made year round, the lack of light and unpredictable weather during the heart of winter shortens the fishing days. In the ocean, Chinook are thick bodied, laterally compressed fish. Chrome bright is the how their coloration is often described. The fish have a blue greenish back with black spots. Freshly caught kings often have a purplish coloration along their lateral lines. The fish we catch in Seward range from 10 to over 50 pounds. Salmon grow rapidly in the saltwater during the summer season. Kings can be finicky until they get ready to feed. An ocean Chinook can go days without eating, so sometimes we see them on our sonar and they simply will not bite! When that time comes, it can get fast and exciting. We have found the most productive method of catching the kings is trolling using downriggers. Our boat is equipped with Cannon Tournament Magnum 10 electric downriggers and custom 16 pound, Penn tackle built for exactly this kind of fishing. On our full day fishing charters, we typically troll near the coastline and around many islands that lie within 10 – 40 miles of Seward. We often catch other species of salmon when trolling for kings. Silver salmon in summer and Keta and sockeye salmon in the spring. Rockfish and lingcod are also caught as well as an occasional halibut. On our long range fishing expeditions we have found several areas well outside the range of day charters that have large populations of resident feeder kings. The fishing in these areas can be phenomenal, especially in early summer. 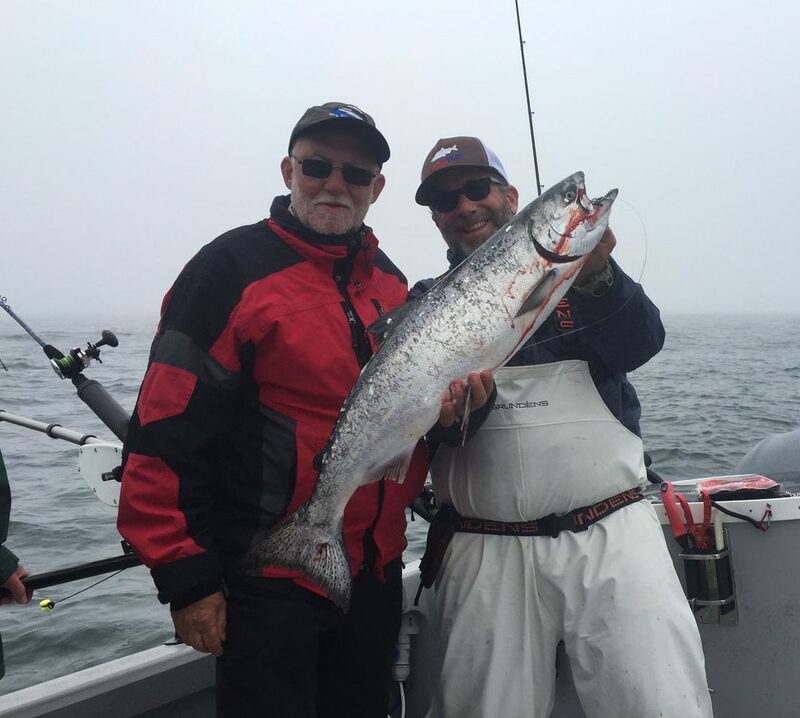 King salmon fishing in Seward requires patience, persistence and the coordination of the crew and fishermen. The satisfaction of catching an iconic Chinook Salmon on our very light, custom tackle is an accomplishment that we feel is well worth the effort. For many fishermen, the silver salmon represents the main reason why fishing Seward is well worth their time. The reputation for silver salmon fishing is legendary in Resurrection Bay and the surrounding waters. During the peak of the run, salmon can be seen jumping everywhere. 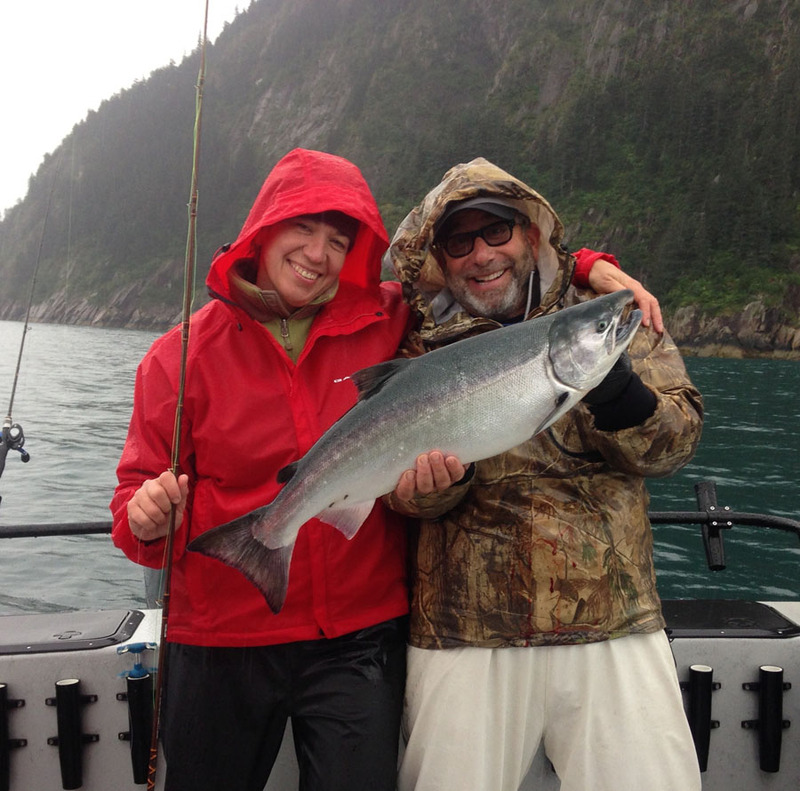 Fishing for silvers from Seward is a great introduction to Alaska salmon fishing. These fish are great fighters and leapers and are tremendous eating. The words silver salmon and Seward are almost synonymous, and the Silver Salmon Derby, the largest fishing derby in Alaska, takes place here. Numerous cash prizes are offered for tagged and heaviest fish caught, and as such visitors are always advised to purchase their tickets before heading out for the day of fishing. Because the Silvers are a schooling salmon, there are often king salmon, pink salmon and rockfish mixed in the schools. One just never knows what might wind up on the end of the line. Weights of the Coho can vary depending on how close they are to their native river. They are voracious feeders and can be caught in ranges between 10 and 15 pounds. Even fish over 20 lbs are occasionally caught. Silvers will migrate into Resurrection Bay and the surrounding areas and then continue right on into the inner bay. Sometimes we find them on the docks, where they jumped out of the water. Even shore anglers catch them once they hit the beaches in the fall. Silvers school up in specific locations, and our experience will bring you to them throughout their entire migrations into the bay or down the coast. Silvers make their appearances around mid-June and continue right into the early fall. Our derby traditionally takes place during the second week of August. While they are smaller in late June, they are in high abundance from the third week for June right up until Labor Day. Trust us, if they re around, we will find them! Silvers at sea are usually caught either trolling with our electric downriggers or when they are schooled up tight, by drifting with a small lead crescent weight and a sharp hook baited with cut plug or strip herring bait. The technique is called mooching. When on top of the school, just about everyone will seemingly have a fish on at the same time and moments like that become a frenzy of catching and keeping. The limit on silver salmon is 3 fish per fishermen when fishing outside Resurrection Bay or 6 per fishermen when fishing inside the Bay. The quality of eating sea-bright silver salmon is beyond compare. This fish is very popular and tasty.